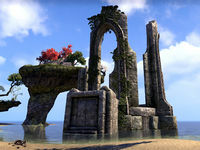 Hightide Keep is an abandoned ruin located in central Auridon, on the beach below the cliffs of Skywatch. A chapter of the book, Auridon Explored, can be found in the ruined keep. The ruins were once part of a sprawling defense complex for the city of Skywatch, defending it against numerous attacks, including from the Sload. The keep was eventually destroyed when a Sload sorcerer blew himself up at the base of the cliff. The resulting explosion destroyed the keep, as well as a large part of the cliffs, leaving only ruins behind. It is now home to a special crafting site, where you may craft items in the Night's Silence set.